A workshop on the “Basics of Using Solar Energy in a Disaster” will be presented at the Solar World Congress in Orlando, Florida, on Friday, August 12, from 2 p.m. until 6 p.m. The course will be taught by Bill Young, a senior engineer at the Florida Solar Energy Center. Participants in the workshop will learn about the uses of solar energy for response, recovery and mitigation functions following disasters. Young will answer the question “How do we properly utilize solar energy to help ensure energy security, provide electrical power for emergency medical and communications usage and effectively use photovoltaics for mitigation in disasters?” by focusing on solar energy sources and their capability to satisfy energy needs in a disaster and provide energy security. He will demonstrate the design and operation of a variety of solar energy systems in disaster situations and will also show how photovoltaics can be used as a critical power supply establishing functionality to disaster-resistant buildings that no longer have their normal source of power. Each participant will receive a booklet describing the uses of photovoltaics during and following emergency situations, as well as a CD of related documents and hard copies of other materials. The workshop, which covers the basics in this use of solar energy, is designed for members of the solar industry, the solar community and the general public. It will be especially pertinent for government decision-makers, business leaders and heads of disaster organizations. Individuals with little experience in the area of solar energy will also find the workshop useful. To register, go to the Solar World Congress registration web page: http://www.swc2005.org/reg_info.htm. You may register and pay on line to attend the entire conference, or you may register for just the workshop. You may also mail your registration. Please contact Bill Young at 321-638-1443 or young@fsec.ucf.edu for more information. 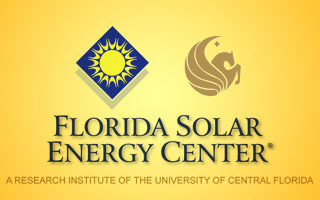 The Florida Solar Energy Center, a research institute of the University of Central Florida, is the largest and most active state-supported energy research center in the country. Current research activities include solar water and pool heating, solar electric and distributed generation systems, energy-efficient buildings, alternative transportation systems, hydrogen fuel, fuel cells and other energy areas. For more information about the center, visit www.fsec.ucf.edu or call the FSEC Pubic Information Office at (321) 638-1015.